Amnesty International India has said that a deliberate attempt is being made to tarnish its reputation by leaking a dossier, supposedly made by investigating agencies, to media without giving it access to any such information. The high profile NGO’s claim follows a Times Now report about proceedings launched by investigative agencies, including Enforcement Directorate (ED) against the rights body for “violations” of rules pertaining to overseas donations. “In the three weeks since we were raided by the Enforcement Directorate, no formal charges have been filed against us. So, it is really shocking to see media coverage of what is alleged to be documents from the investigation. If the authorities believe that Amnesty India has committed an offence, they must prove it in a court of law. However, the Enforcement Directorate seems to be leaking selective information and conducting a media trial,” said Aakar Patel of Amnesty India. On November 14, a prominent news channel ran two hour-long special shows on the Enforcement Directorate’s raids on Amnesty India. The anchors claimed to have accessed the entire dossier of investigations done by the investigating agency. They also showed visuals of the documents, including the investigation report, testimonies and bank documents that are a part of the investigations. It is important to note that Amnesty India has still not been given access to the dossier and has repeatedly been denied access to such information by the agency. At one point, the anchor read from what is alleged to be a copy of the statement given by Aakar Patel, the Chief Executive Officer of Amnesty International India Private Limited and the Managing Trustee of Indians for Amnesty International Trust, to the Enforcement Directorate. This document was also flashed repeatedly during the show. The Enforcement Directorate officials refused to provide a copy of said statement to Aakar Patel, when it was requested during the search and again on October 31 in the Enforcement Directorate’s office. They refused on the grounds that the copy is confidential and can only be shared after the charges are framed. This is not the first time the investigating agency has leaked information about Amnesty India to the media. Ahead of the raids on 25 October, of which Amnesty India was not aware, the government authorities had leaked a cache of documents marked “secret” that cast Amnesty India’s operations in a dark web of intrigue. Within moments of the raid, a smear campaign was launched on social media and sections of the pro-government media that have long been opposed to the work being done by Amnesty India. 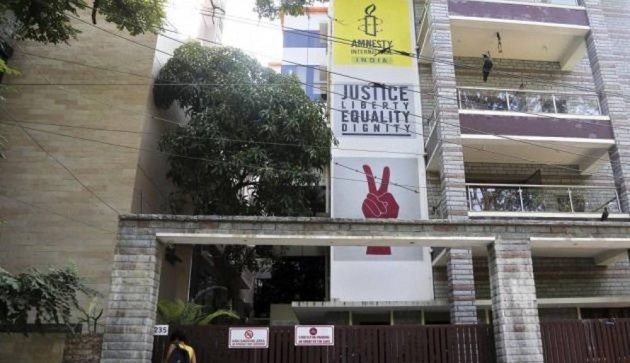 On October 25, 2018, Amnesty India endured a ten-hour-long raid as a group of officers from the Enforcement Directorate, a financial investigation agency under the Ministry of Finance, entered the premises and locked the gates behind them. Some of the staff were ordered to not leave, shut their laptops and not use their mobile phones. Most of the documents asked for during the search were available in the public domain or were already filed with the relevant government authorities. Details of our current structure, which was the focus of much of the questioning, have been available on our website since 2014. Following the raid, and despite operating in compliance with relevant national regulations, the accounts of Amnesty India have been frozen, effectively stopping our work. Simultaneously, the Ministry of Home Affairs has also initiated investigations into the funds received by Amnesty India. The latest leak of a dossier on Amnesty India by the Enforcement Directorate based on its ongoing investigations, indicates a deliberate attempt by the government to tarnish Amnesty India’s reputation.